Greenleaf Book Group Press, 9781608323760, 170pp. Even though Karen Purcell excelled in math and science in high school, nobody ever talked to her about a career in the STEM fields. Finally, in her senior year, when she was frantically trying to decide on a college and course of study, her physics teacher commented that she should consider engineering. Lack of exposure was the first hurdle that Karen would face on her path to success as an engineer and entrepreneur, but it certainly wouldn t be the last.Tackling an important social issue from a personal perspective, Karen describes the trajectory of her own career in engineering, including the struggles she endured. 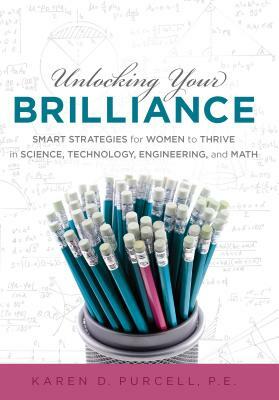 Through her story and stories from women in other fields, she explores the hurdles women in the male-dominated STEM world must overcome and offers pragmatic strategies for moving beyond them. From gaining exposure to occupations early in life to earning the respect of male colleagues to balancing a personal life with career pressures, Karen will empower you to realize your full talents.Part inspiration, part strategic career advice, "Unlocking Your Brilliance" can help you pursue your passions and leverage your talents to create the professional and personal life you want. Karen Purcell, P.E., is a dynamic engineer, entrepreneur, and author focused on helping women create meaningful futures in the STEM fields. As the founder and president of PK Electrical, she draws on her experience to inspire young women to enter the STEM fields with confidence. Her nonprofit organization, STEMspire, was founded to support that mission. She is actively involved in the Reno Tahoe Entrepreneurs Organization and has held numerous officer positions. She also won a 2012 "Reno Gazette-Journal" Entrepreneur of the Year Award.Karen is an avid marathon runner, Girl Scout troop leader, and volunteer with Big Brothers, Big Sisters. She lives in Reno, Nevada, with her husband and two daughters."